For the classicist, see Norma Miller (classicist). Norma Miller (born December 2, 1919) is a Lindy hop dancer known as the "Queen of Swing". She is also a choreographer, actress and comedian. Norma Miller was born in Harlem, New York, in 1919 to mother Alma and father Norman, a soldier, both from Bridgetown, Barbados. Norma was named after her father, who died from pneumonia a month before her birth. She had an older sister, Dot. Miller took dance lessons from a young age. When the Great Depression began in 1929, Miller and her family moved to a new apartment near the Savoy Ballroom. In 1936, the group began a tour of the U.S. with headliner, Ethel Waters. In California the group appeared in A Day at the Races, a movie by MGM Studios. After the tour, Miller was hospitalized for exhaustion. Miller rejoined the group in 1938. For a second time the group performed at the Harvest Moon Ball, hosted that year by Ed Sullivan. Miller and her partner placed in the top three, and Sullivan invited them to perform in his Toast of the Town revue. Next, the Lindy Hoppers were asked to appear in the 1941 movie Hellzapoppin'. She has a memorable role as a dancing cook in the film. When they returned from filming the group set out on a six-week tour of Rio de Janeiro. Because of the start of World War ii, they ended up staying for 10 months. From 1952 to 1968, Miller directed and toured with the Norma Miller Dancers and Norma Miller and Her Jazzmen, both of which included Frankie Manning's son Charles "Chazz" Young as well as her long-time partner Billy Ricker. In 1954, her group toured nationally with the Count Basie show. She and Cab Calloway introduced their comedy skit of Romeo and Juliet while performing in Miami Beach, where she lived until 1959. In 1972, Miller traveled to Vietnam on a solo comedy tour. She moved to Las Vegas in 1977, where she starred in and produced shows. She returned to New York In 1982, where she lived and worked until 1990, when she returned to Las Vegas. Miller has written several books, including Me & John Biffar: A Love Story, which chronicles her friendship with filmmaker John Biffar. Another work, Swing, Baby Swing! follows the evolution of swing dance into the 21st century. Swingin' at the Savoy: The Memoir of a Jazz Dancer, Miller's autobiography, describes her early life and meetings with the well-known jazz musicians and swing dancers of that time, including Frankie Manning, Ella Fitzgerald, Duke Ellington, Count Basie, Ethel Waters, and Chick Webb. Stompin' at the Savoy: The Story of Norma Miller is a children's book chronicling her life. In 1977, Miller and long time friend Redd Foxx co-wrote a book called the Redd Foxx Encyclopedia of Humor, also known as the Redd Foxx Encyclopedia of Black Humor. In 2003, Miller was honored with a National Heritage Fellowship from the National Endowment for the Arts for creating and continuing to preserve "the acrobatic style of swing dancing known as the Lindy Hop". Norma Miller had a long-term relationship with fellow performer Roy Glenn. They met while filming Hellzapoppin' and reunited on her solo tour of the U.S. They put off marriage plans many times and eventually decided to go their own ways. Miller appeared in six films and four television series. Her most well-known film appearance is in the swing dancing scene in the film Hellzapoppin', featuring Whitey's Lindy Hoppers. ^ a b c d e f g h i "Norma Miller: National Visionary". www.visionaryproject.org. National Leadership Visionary Project. 2013. Retrieved 2017-04-24. ^ a b Miller, Norma; Jensen, Evette (1996). Swingin' at the Savoy: The Memoir of a Jazz Dancer. Philadelphia: Temple University Press. ISBN 9781566398497. OCLC 34618173. ^ Sago, Renata. "At 95 Years Old, Norma Miller, the Queen of Swing, Still Reigns". Retrieved 2017-04-10. 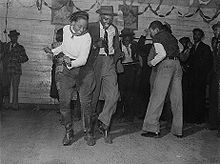 ^ "'Alive And Kicking' Chronicles Deep History Of Swing Dancing". NPR.org. Retrieved 2017-04-10. ^ Govenar, Alan B. (2006). Stompin' at the Savoy: The Story of Norma Miller. Illustrated by Martin French. Cambridge, MA: Candlewick Press. ISBN 9780763622442. OCLC 56421892. ^ Foxx, Redd; Miller, Norma (1977). Redd Foxx Encyclopedia of Black Humor. Pasadena, CA: W. Ritchie Press. ISBN 9780378083027. OCLC 03430216. ^ "NEA National Heritage Fellowships: Norma Miller". www.arts.gov. National Endowment for the Arts. Retrieved 25 October 2017. ^ "Norma Miller." IMDB. N.p. n.d. web. 11 Nov. 2014. Wikimedia Commons has media related to Norma Miller.